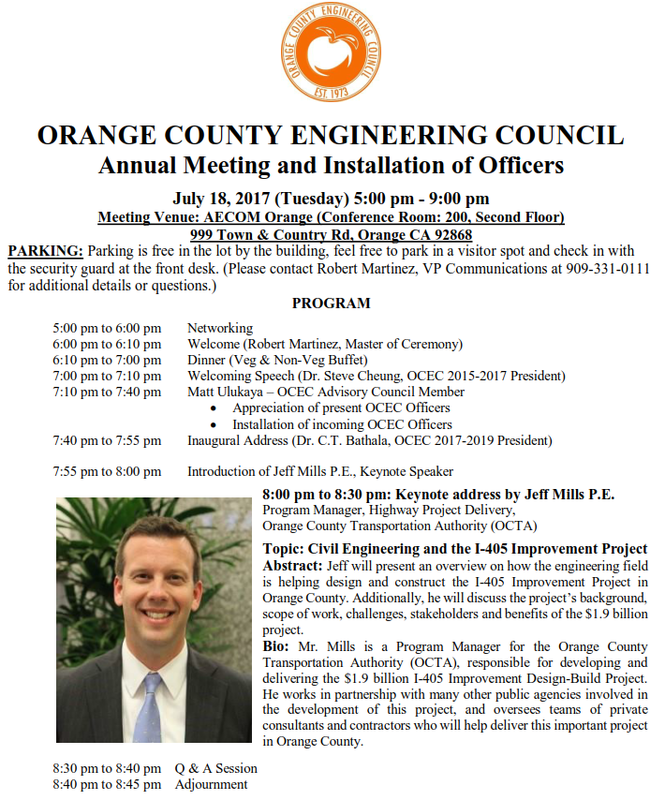 Orange County Engineering Council (OCEC) will be hosting it's Annual Meeting on July 18th, a time to celebrate the accomplishments of the previous year, witness the induction of the new Executive Board for the following term, and also participate in a keynote address relating to the I-405 Improvement Project here in Orange County! This event is free to members but open to the public. If you've ever wanted to learn more about what OCEC does and how we impact our community we encourage you to attend and learn more. This year’s Annual Meeting will be held on July 18th, from 5:00 – 9:00 pm at the AECOM office in Orange: 999 Town & Country Rd, Orange CA 92868. Jeff Mills P.E., of OCTA will be delivering a Keynote Address on the topic: Civil Engineering and the I-405 Improvement project. A buffet style Dinner will be provided, as well as a networking session prior to the event. Please see the attached flyer for complete program details. Cost: $20 per guest “Early Bird” tickets, on sale now until July 10th, $25 per guest after. Orange County Engineering Council is a non-profit organization dedicated to enhancing the public image of engineers and scientists; to promote the interaction of professional societies and engineering/scientific corporations and universities in and around Orange County, California. We thank you for your involvement and would also like to encourage you to share this event with similar, like-minded professionals to help advance our organization. Please feel free to forward this to colleagues and friends so they can learn about and be a part of exciting engineering topics going on in our local community! Mr. Mills is a Program Manager for the Orange County Transportation Authority (OCTA), responsible for developing and delivering the $1.9 billion I-405 Improvement Design-Build Project. He works in partnership with many other public agencies involved in the development of this project, and oversees teams of private consultants and contractors who will help deliver this important project in Orange County. Prior to joining OCTA, Mr. Mills was a Project Manager in the private consulting sector and delivered several complex highway projects. His design-build experience includes the I-15 Reconstruction in Salt Lake City, the Orange Line in Los Angeles, the SR-22 HOV Lane Project in Orange County and the SR-91 CIP Project in Riverside County. Additionally, Jeff has been involved in many other significant planning and final design projects in Southern California, including the I-5 Gateway Project in Orange County and the Schuyler Heim Bridge Replacement in the Port of Long Beach. During his 18-year career in the private consulting sector, his assignments and responsibilities were in the area of project delivery.